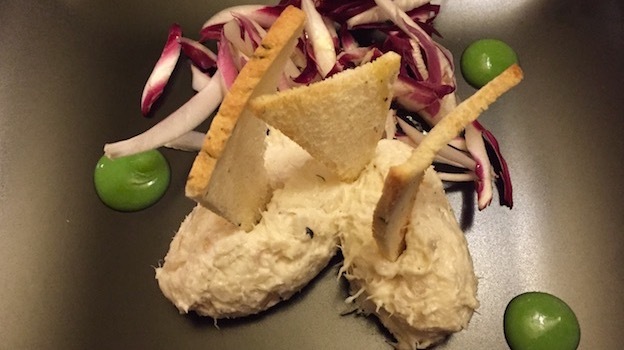 One of my favorite restaurants in Italy, a sentiment no doubt fueled by memories of halcyon childhood lunches and dinners with the family is Mara and Maurizio Martin’s Osteria da Fiore (though the website proudly states ‘ristorante’, not ‘osteria’). In fact, the place is much more of a restaurant than osteria, with an elegant dining room and professional waiters, some of whom have seemingly worked at Da Fiore forever. The restaurant asks that guests refrain from wearing sleeveless shirts or short trousers, and that too is more restaurant than osteria mode. The refined setting (though tables can be a little too close and my advice is to ask ahead for a table that won’t make you feel too snug) is made that much more romantic by a unique balcony table available for two people overlooking the canal, naturally the most coveted seat in the house come spring and summer. 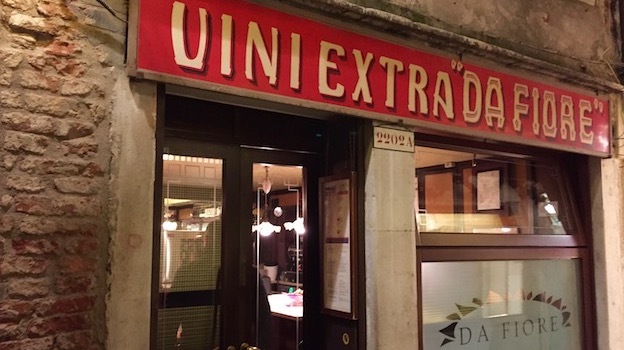 Clearly, Da Fiore’s well heeled and well behaved patrons don’t need to worry about what the restaurant calls itself, for both food and wines are fine and the place guarantees a memorable Venetian meal. 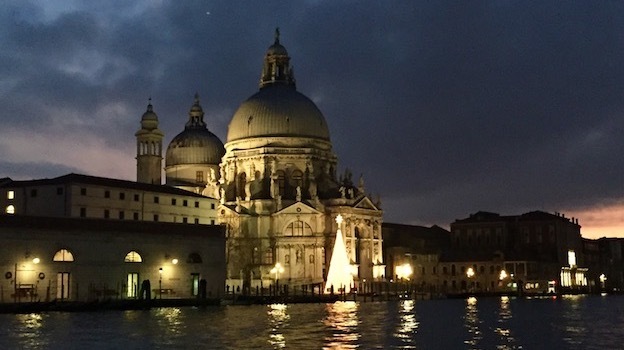 The restaurant offers a creative twist on traditional Venetian recipes many of which Mara learned to cook from her grandmother, an accomplished chef. The strict selection of local produce and roughly 700 different wines and fine spirits to choose from are also part of Da Fiore’s noteworthy charms. That said, it is the impeccable rendering of Venetian staples that best showcases Mara’s culinary talent. 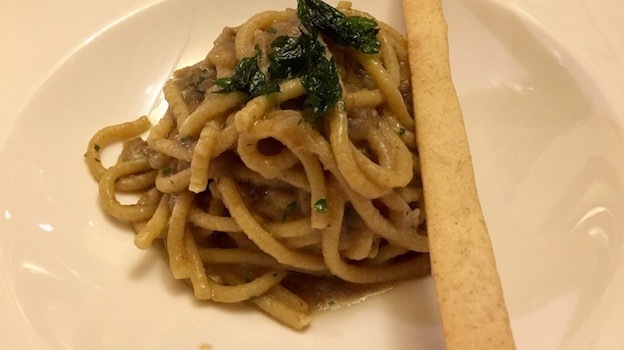 For example, while you’ll find baccalà mantecato everywhere in Venice, Da Fiore’s version is easily one of the two or three best you’ll try anywhere, something that will jump out at anyone paying even a modicum of attention to what he or she has eaten during their time spent in the city. My two very fresh appetizers, a clean and sweet and salty crabmeat dish and a luxurious, almost sultry baccalà mantecato, were perfectly matched to two extremely rare Veneto white wines (only about 1300 bottles/year made of each) that Da Fiore has in exclusivity for Venice (another thoughtful touch). Marchiori is an outstanding Veneto producer, better known for his excellent Proseccos (see my recent article in Vinous: Bubbles Ahoy, Veneto’s Great Sparklers for more). The 2015 Marchiori Perera and the 2014 Marchiori Bianchetta (Bianchetta Trevigiana actually, but that’s not stated on the label) are delightful mono-variety examples of what these two now rare indigenous Veneto grapes can bring to the table (literally, in fact). Both were once an important part of the blends used in Prosecco (which historically was not made just with Glera). While the very light-bodied Perera is perfumed and vibrant (and an absolutely perfect foil for the creamy rich baccalà mantecato as well as the moleche fritte that followed later), the Bianchetta offers relatively greater size and perceived sweetness (though it’s a totally dry wine) and measures up better with the crab dish. The outstanding 1986 Nikolaihof Weingebirge Riesling Spätlese Trocken pairs beautifully with the two pasta dishes, adding something to each. At once crisp and leesy, with hints of peach, petrol, freshly cut grass, chamomile and bitter orange marmalade, it adds another dimension to the Bigoli in salsa Veneziana (a local sauce based on sweet onions and bitter radicchio rosso, each of which stands out more thanks to the citrus-herbal notes of the wine) and lift to the creamy, thick tagliolini gratinati. The 1997 Quintarelli Recioto della Valpolicella remains one of the truly iconnic versions of this wine. Sweet and rich yet remarkably light on its feet (like Quintarelli’s Amarones), it offers a refined mix of red plums, mocha, and sweet spices. Best of all, it drinks perfectly right now, and brings this wonderful meal to a fabulous close.